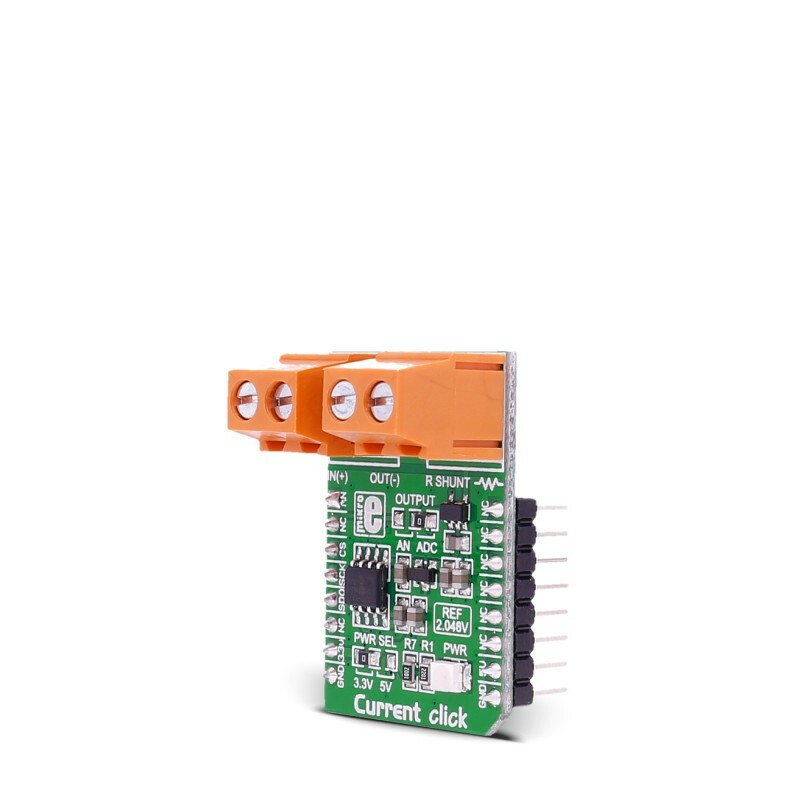 Current click is an add-on board used for measurement of electric current. It features INA196 current shunt monitor, MCP3201 12-bit ADC, MAX6106 voltage reference as well as two screw terminals. 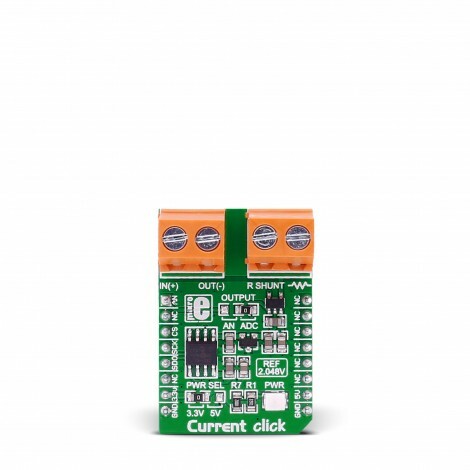 The click is designed to run either 3.3V or 5V power supply. 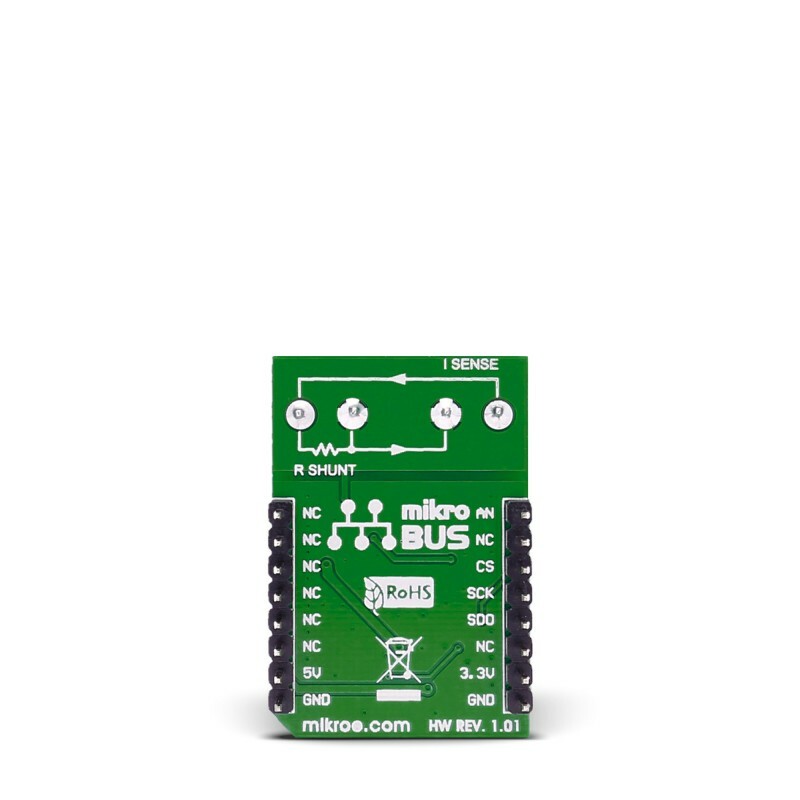 It communicates with the target microcontroller over SPI interface with additional functionality provided by the AN pin on the mikroBUS™ line. Current click serves as the current measurement device. The board receives current from the output circuit connected to IN(+) and OUT(-) pins of the first screw terminal. INA196 IC converts this current into a voltage. The second screw terminal is used for the external shunt. In order to measure current values in various bands, you need to provide the shunt of the appropriate value. Current click can be used for DC Current measurement in the range of 2-2048mA depending on shunt resistor. Four shunts with different values are provided in the package. 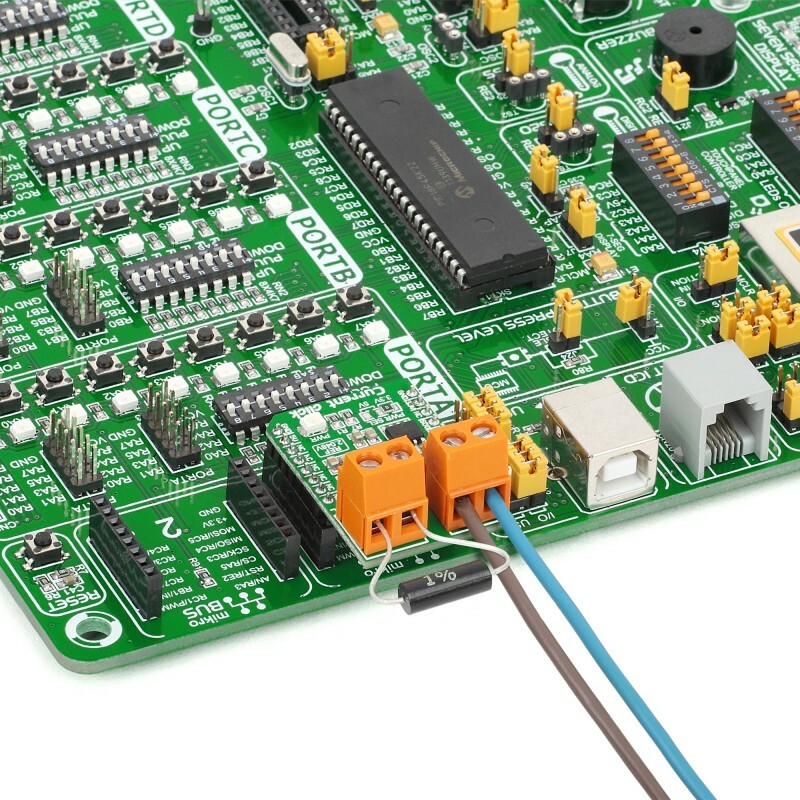 Current click communicates with the main board microcontroller via SPI interface (using ADC) or via AN line (directly connected to the microcontroller AN pin) depending on the position of the J1 SMD jumper. This jumper is soldered in ADC position. The zero-ohm SMD jumper (J1) is used to select whether 3.3V or 5V power supply is used. Jumper J1 is soldered in 3.3V position by default. This table shows how the pinout on Current click corresponds to the pinout on the mikroBUS™ socket (the latter shown in the two middle columns). Code examples for Current click, written for MikroElektronika hardware and compilers are available on Libstock. The following code snippet shows main function, which initializes SPI and graphic interface, and then performs processing of the measurements periodically.